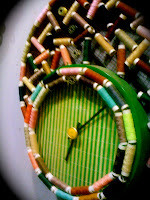 I met Dr Mohammed at the El Sawwy Culture Wheel coincidentally and was fascinated by his range of clocks. 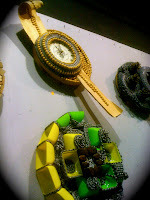 Using the most conventional materials, reinventing the way we observe these items, putting them together to create art. According to Dr Mohammed who's also a lecturer at a Faculty of Arts, he would like his viewers to be shocked, to think outside of the box, to trigger the creativity in all of us, even a little eccentricity. What this means to me is there is room for everyone and there is room to be more. A professor can be an artist. A banker can be a social entrepreneur. A lawyer can be a cook. Dr Mohammed's favourite piece is the one on the right. He picked up the tree bark from the road and draws inspiration from everywhere, finding comfort in turning the worthless to the worthy. Dr Mohammed's work calls for a little more attention, a little bit more time in appreciating the details and in return, a little bit more joy in appreciating the norm in an unusual way..